Jean's Ring was commissioned for her 10th wedding anniversary. 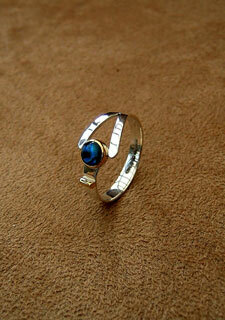 The ring is formed of a silver band holding an 18ct gold setting for a paua shell cabochon stone. A small gold rod applied to the band alongside the gold bezel creates the number 10.